When it comes to holiday drinks, most people think of Egg Nog (Dale DeGroff’s Uncle Angelo’s is the best) or Hot Buttered Rum. Both of these drinks can be delicious if prepared correctly, but it’s easy to get bored with these same drinks time and again throughout the holiday season. Our favorite holiday drink is actually a very old classic cocktail (developed in the 1820’s) made with egg, sugar, milk, cognac, and rum called the Tom and Jerry. We first had this drink at the Teardrop Lounge in Portland, Oregon where it was served from a large punch bowl. We fell madly in love with the drink but never had an occasion to make a huge punch bowl of it. A short while later we were at Rum Club, also in Portland, and saw the drink prepared individually from batter taken out of the freezer. That’s when the lightbulb went on and we started making them for ourselves. To make this celebrated beverage, a batter must first be prepared in the following manner. Procure any number of eggs and separate the whites from the yolks. Beat the whites until stiff and the yolks until thin; then pour both together into a large bowl and mix with enough sugar to make a thick paste. Your batter is now ready, so when you wish to make a Tom and Jerry, rinse out a mug, cup or glass with boiling water (this is done to heat it), place a heaping teaspoonful of the batter into the hot mug (mugs are generally used to serve this drink), add a jigger (1 1/2 oz) of cognac and a dash of St. Croix (Dark) rum, fill the glass with hot milk (some use hot water), and stir until the batter is all dissolved, grate nutmeg on top and serve. We enjoyed the Boothby version (especially when we used 1/2 hot milk and 1/2 hot water) which David Wonderich has done a good job of updating. Our Tom & Jerry’s were good, but the batter never quite had the same thickness that we experienced with the Rum Club Tom & Jerry. Recently we stumbled upon Author Andrew Bohrer’s riff on the Tom & Jerry which added a some butter to the mix and specified “super fine baker’s sugar” which helped change the consistency of the batter dramatically. (Bohrer has a lengthy step-by-step guide to the cocktail on his site Cask Strength). Here’s an amalgamated version of the drink from our experiences and the various recipes we’ve used. Separate the egg yolks and whites into separate bowls. In the yolk bowl add the butter (which needs to be warmed to room temperature) and the sugar. The goal here is to make a batter and so it’s helpful to use a hand mixer to mix the butter, yolks and sugar (like you were baking a cake). In the separate bowl beat the egg whites until they are stiff (like making a meringue) a full kitchen mixer helps make this MUCH easier. Fold the beaten egg whites into the yolk/sugar/butter mix so they are all incorporated. Stir in the cinnamon, allspice and vanilla (aproximately 1 tsp of each, but season to taste). This batter can be frozen or put in the fridge. If refrigerating we like to add a little rum to the mix to help preserve it (you can also add a pinch of cream of tartar to the mix which will help keep it from separating). We prefer to freeze it . When you are ready to make your Tom & Jerry, put 1 heaping tablespoon of this batter in a small mug or tumbler. 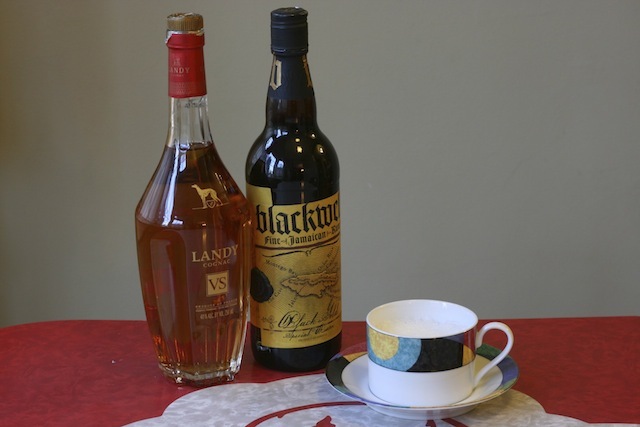 Add 1 oz of brandy and 1 oz of dark rum “stirring constantly to avoid curdling”. Then top with hot water or hot milk aprox 4 oz (or a combination of 1/2 hot milk or 1/2 hot water) it’s really personal preference. Top with grated nutmeg.